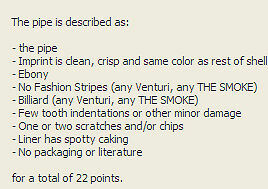 The value of pipe #499 is 22 points. The 2003 CORPS pipe show in Richmond, VA was notable for its being held the day after hurricane Isabel smashed into the area. Attendance was surprisingly good considering the electric and water outages that were part of the weekend. I'm glad I went because Tom Colwell had five pipes for me. Since I have a better example already in the collection and another to smoke, this one will be on the Pipes for Sale page. It has been smoked a lot but well maintained. The paint has a .75" shallow scratch on the heel, but is not bad overall. The mouthpiece shows a lot of shallow toothmarks. The bowl liner is very well cleaned but does have some cake remaining. George Sackett became another fan of these easy to clean and great smoking pipes and bought this one for his rotation.